Perfect Solution for limited garden space, poor garden soil . Easy to use: unfold, fill and grow; Ideal for an herb garden, small flower garden or vegetables. Designed to allow roots to breathe, release heat naturally prevent root circling andamp; Easily drainage of water. Fabric Grow Containers can be used for soil or hydroponic applications both indoors and outdoors. Tips: As the Garden Bed is empty can not become fixed and unchangeable. So please allow us to have 0-3cm error about the size. ❤If you have any questions, please fell free to contact us. ✧Heavy Duty Materials-Not only are our grow bags are made of heavy duty thickened non-woven fabric so that they are durable, corrosion and wear resistant and lasting for years. ✧Fun Gardening-If you have no place to grow vegetable, this fabric garden bed is the best choice. Just put it in your terrace, patio, yard and fill with fresh new earth. Plant your vegetables, flowers etc. ✧Excellent Protection-Made of a proprietary fabric material, a highly durable, UV resistant, non-woven fabric that provides exceptional air flow throughout the soil and root systems and allows excess moisture to easily drain away. 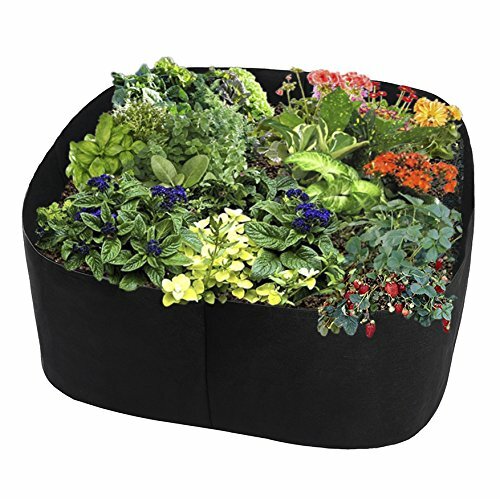 ✧Great For-These garden planter bags are suitable for indoor and outdoor planting. unfold, fill and grow. Ideal for an herb garden, small flower garden or vegetables. ✧Easy to Storage-No need to have empty garden pots and containers cluttering up your yard in winter. When the growing season is over, simply empty the earth out of the fabric bag and pack it away. View More In Grow Bags. If you have any questions about this product by ASSR, contact us by completing and submitting the form below. If you are looking for a specif part number, please include it with your message.